From the creative team behind the smash hit series ARROW, comes THE FLASH, a fast-paced super hero drama that follows the high-speed escapades of the ‘fastest man alive’. 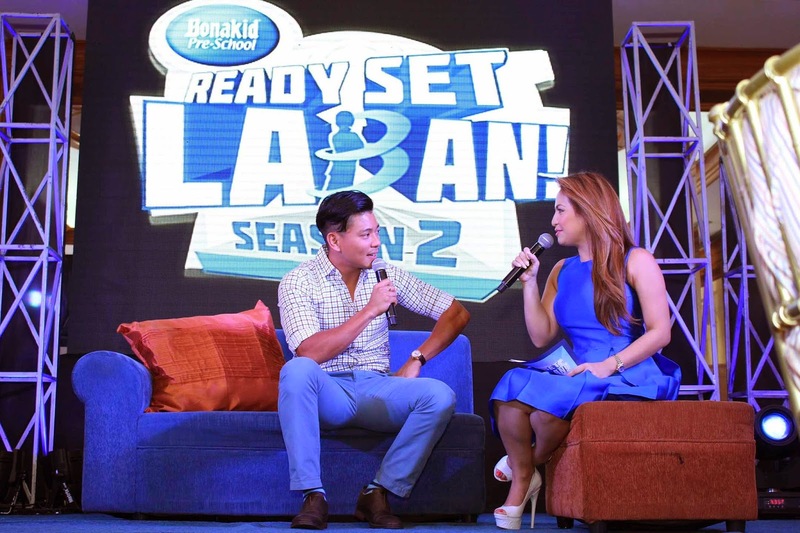 Set to premiere in the Philippines on October 8, the series will be made available to both free TV and cable viewers as it airs simultaneously on ETC and JackTV. Written by Marc Berlanti, Andrew Kreisberg and DC Entertainment’s Chief Creative Officer Geoff Johns, THE FLASH narrates the story of Central City Police scientist Barry Allen (Grant Gustin), whose life is dramatically changed when he is involved in a devastating accident at the S.T.A.R. Labs Particle Accelerator facility. Suddenly he finds himself charged with the incredible power to move at super human speeds. After a close friend finds themselves in danger, Barry vows to use his newly developed abilities to help protect the people of Central City and stop the influx of villains – many of whom have also been altered by the particle accelerator explosion. 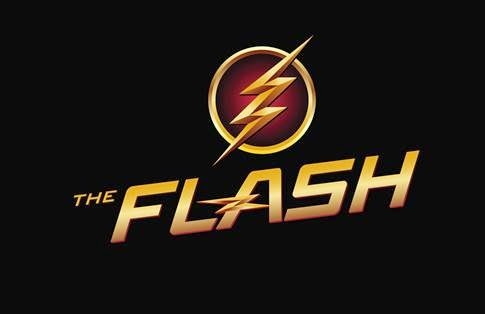 Starting Wednesday, October 8, THE FLASH will air the same day as the U.S. (within 6 hours of its U.S. premiere) via satellite at 3PM with a primetime telecast at 8PM on ETC and JackTV. Jack TV is seen on Destiny Cable channel 30, Destiny Digital channel 51, SkyCable channel 51, GSAT channel 19, and on Cable Link channel 36. ETC is seen on UHF channel 21, SkyCable channel 16, Destiny Digital channel 16, Destiny Cable channel 14, Cignal channel 9, and on Cablelink channel 34. If you missed the premiere of the 25th season of The Amazing Race last Saturday, 27 September, you have the chance to watch it again tonight, Monday September 29 at 7:35 pm. Hosted by Phil Keoghan, the adventure reality competition will see 11 pairs, including surfers, urban bike racers, food scientists, realtors, fire fighters, professional wrestlers, and dentists, race each other around the world for the US$1 million prize money. 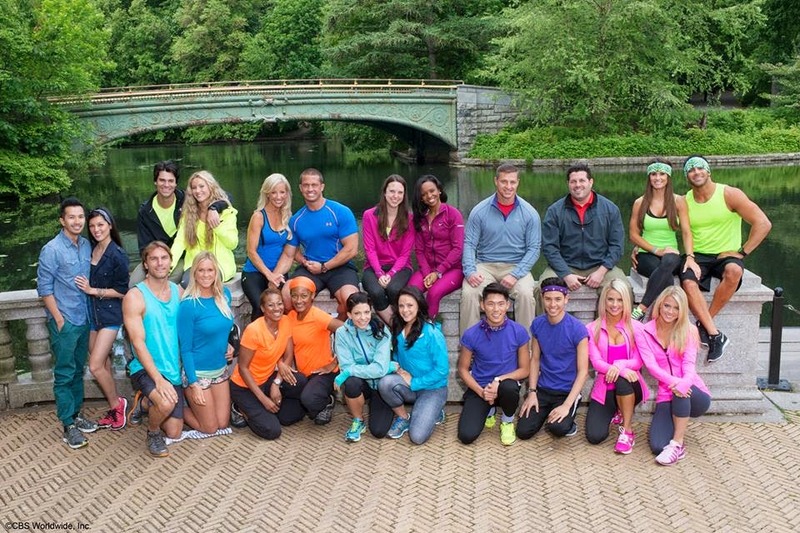 The Amazing Race Season 25 premiere encore tonight Monday, 29 Sep at 7.35pm. 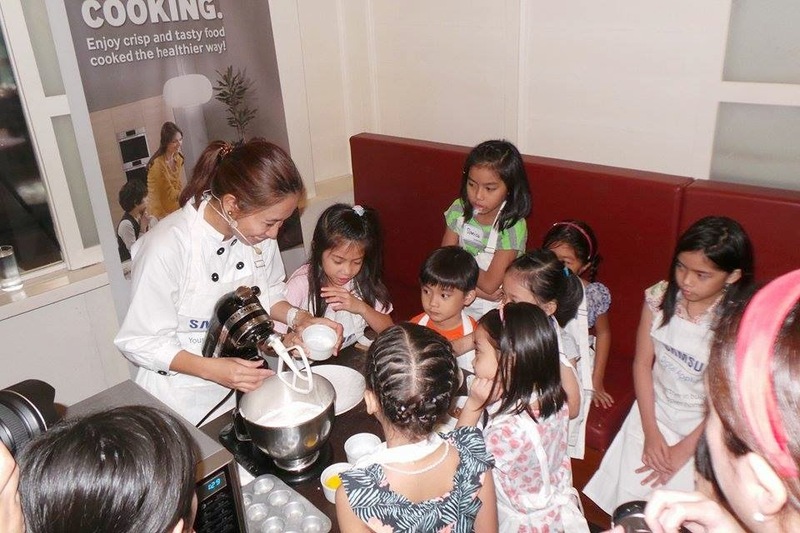 Samsung Digital Appliances marked the date on September 27, Saturday with moms and children at Chef Laudico Guevarra's restaurant at Addition Hills San Juan. It was a day to remember as Filipino chef couple and Samsung Digital Appliances ambassadors, Rolando and Jackie Laudico, joined moms and kids whipped up a simple yet delicious Pork barbecue stuffed sweet potato rolls to everyone's delight with the Samsung Microwave oven and showed how the new Samsung Showcase Refrigerator could make a difference in every filipinos kitchen, with its optimum use of space, made for the family in mind. Upon seeing the new Samsung Refrigerator I knew right away that this should seat in my kitchen as it becomes my dream refrigerator upon I laid my eyes on them, with its classy and sleek design. 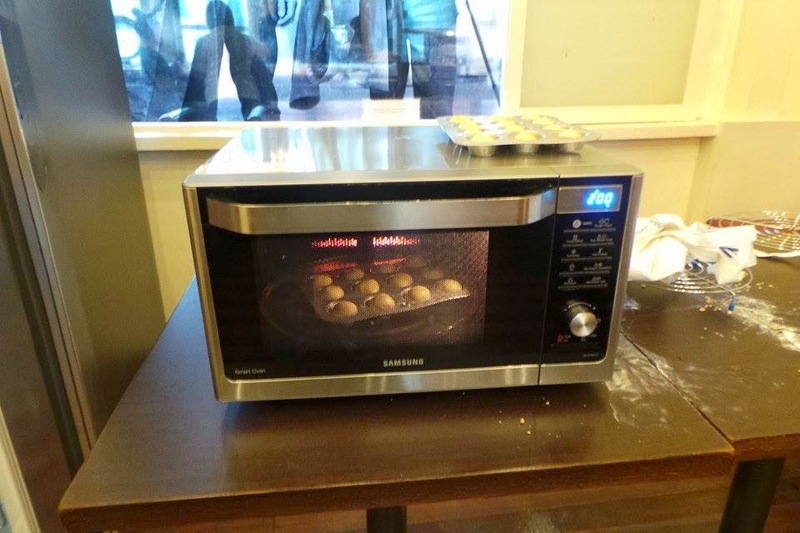 Samsung introduces the latest kitchen innovation in their product lineup. The new Samsung Food Showcase Refrigerator delivers unparalleled organization and provides optimum use of space to help make kitchen life more organized. The concept was born after the Samsung Design team investigated families’ everyday lives and how they use their refrigerators, noting that the typical refrigerator design has become inconvenient to the modern lifestyle. 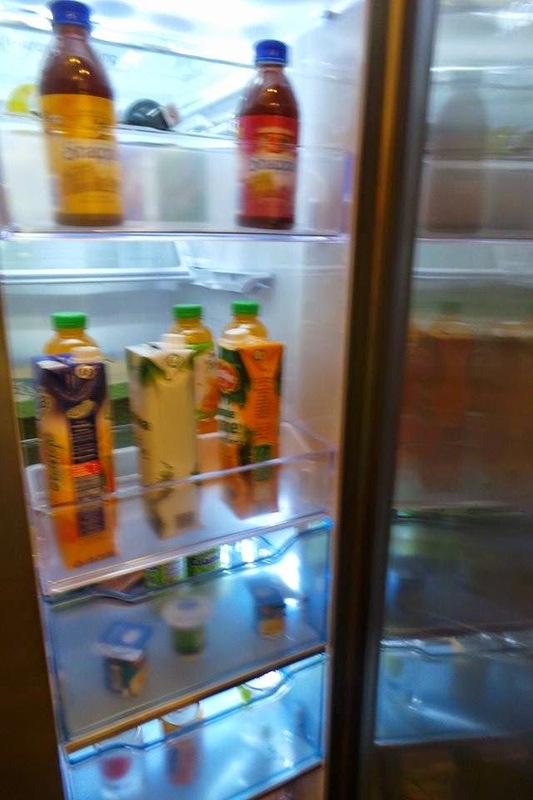 when someone doesn’t know where something has been stored, he or she takes a long time rummaging through the refrigerator until the item is found. With these insights, Samsung’s product developers were determined to create a refrigerator which not only helps families stay organized and keep their food fresh but also looks beautiful in the kitchen. 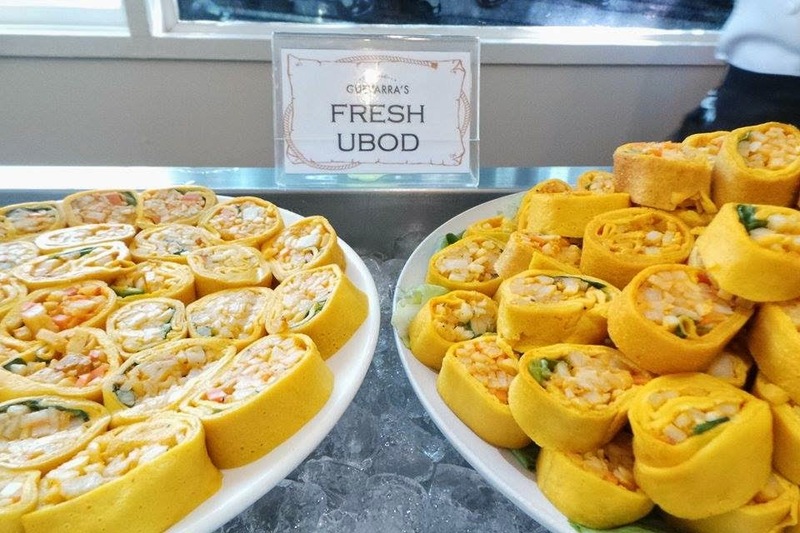 The Samsung Food Showcase Refrigerator features two layers that optimize the use of space and provide clearly deﬁned zones for frequently used food. it comes with three functional zones – the Cooking Zone, which stores frequently used items, such as eggs, cheese and sauce bottles; the Family Zone, which stores items for the entire family like beverages and fruit; and the Kids Zone, which stores children’s snacks and is located at the lower part of the Showcase considering the height of children. This customized storage space allows all users to easily ﬁnd items that they need accordingly. The lnner Case keeps groceries fresh, as it is located deeper within the fridge, behind the outer Showcase, making it the perfect place to store and preserve perishable items such as vegetables, fruits and meats. As compared to standard refrigerators, which have shelves and compartments that aren’t fully used, the Samsung Food Showcase Refrigerator maximizes every inch of available space. The location and dimensions of each zone was a top consideration when it came to the design and development. 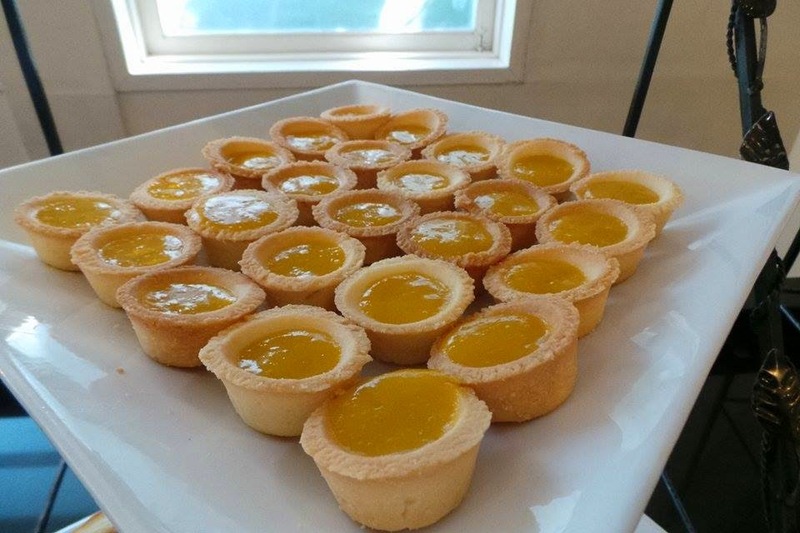 To truly study this, the design team collected everyday food items and ingredients, such as beverages, snacks and sauces, and identiﬁed the heights and surface areas of each item to determine the optimal locations. In addition, the ice Master is built into the door, providing valuable extra space by freeing up two additional shelves in the freezer. 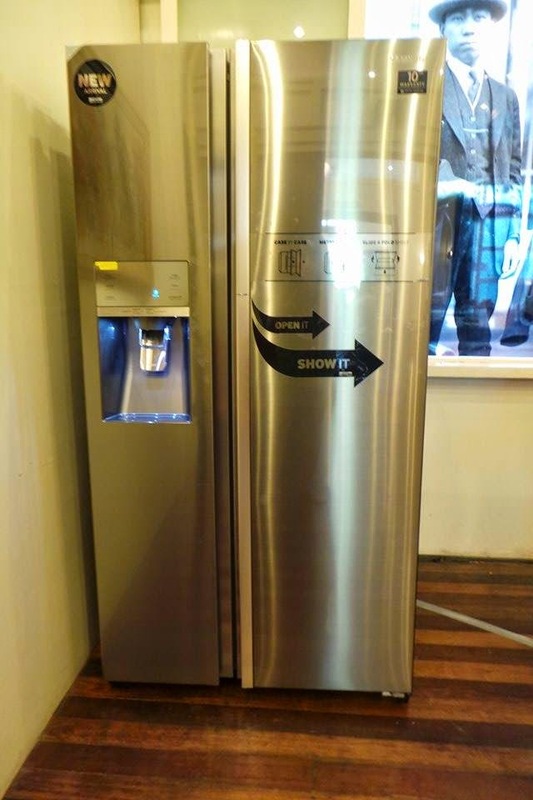 New to the Samsung Food Showcase Refrigerator is the Ice and Water Dispenser feature, which delivers refreshing chilled filtered water with a touch of a button. The Slide & Fold Shelf adds extra flexibility to storage. 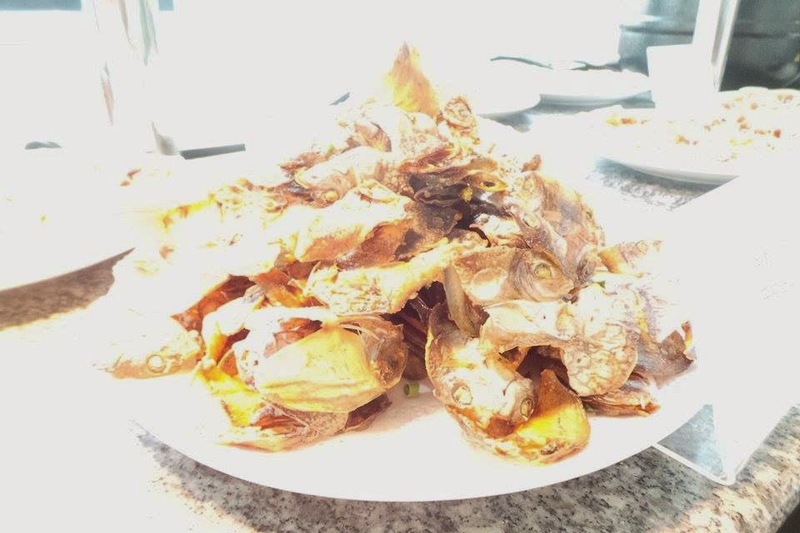 it can be easily removed, folded up or raised and lowered to fit in any sized items, including tail and bulky containers, so there’: no wnsied -spare. 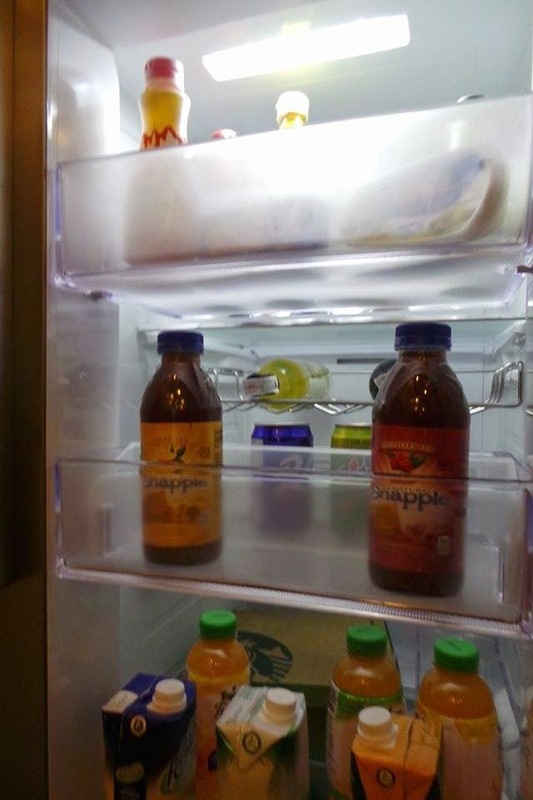 With the Samsung Food Showcase Refrigerator, all frequently used Items have a designated easily accessible space. 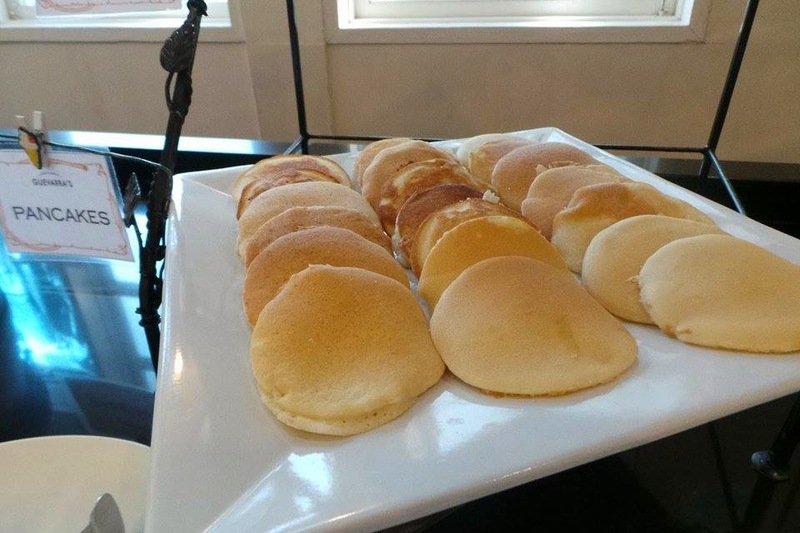 This helps users save time when it comes to food preparation. 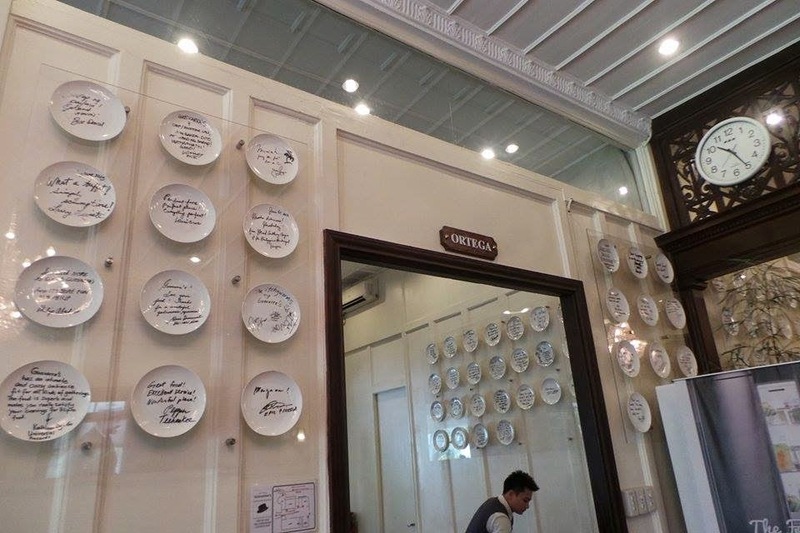 With frequently used items stored in the Cooking Zone, customers will no longer need to rummage through the refrigerator and allow them to keep a close eye on which items are used more often. 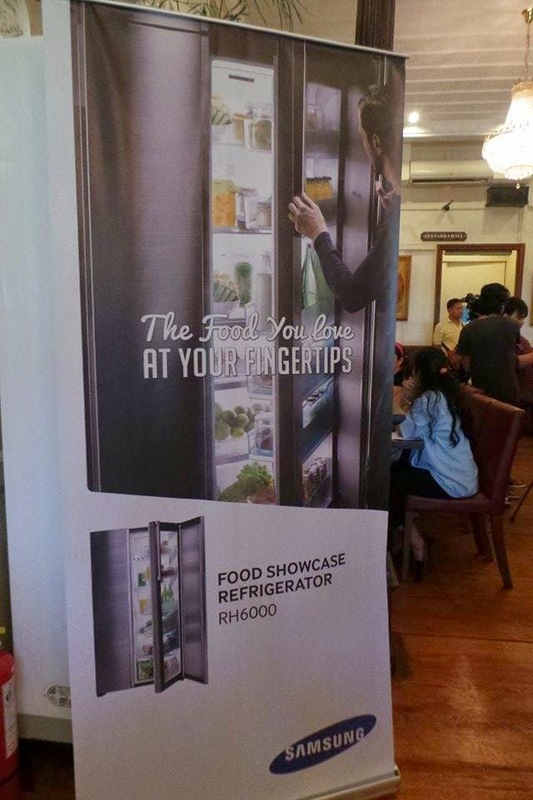 Food also stays fresher for longer in The Samsung Food Showcase Refrigerator. 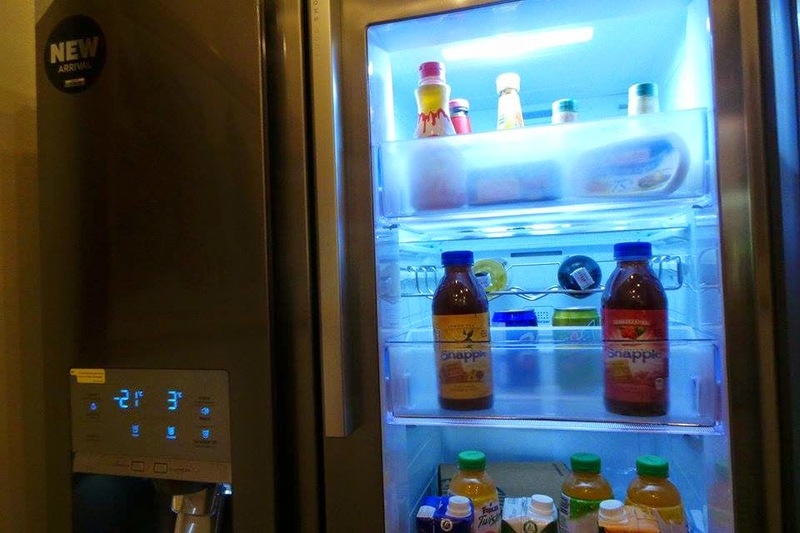 its unique features retain cool air within the refrigerator even if the Showcase door is frequently opened, and ensure an even and constant temperature from top to bottom, front to back. 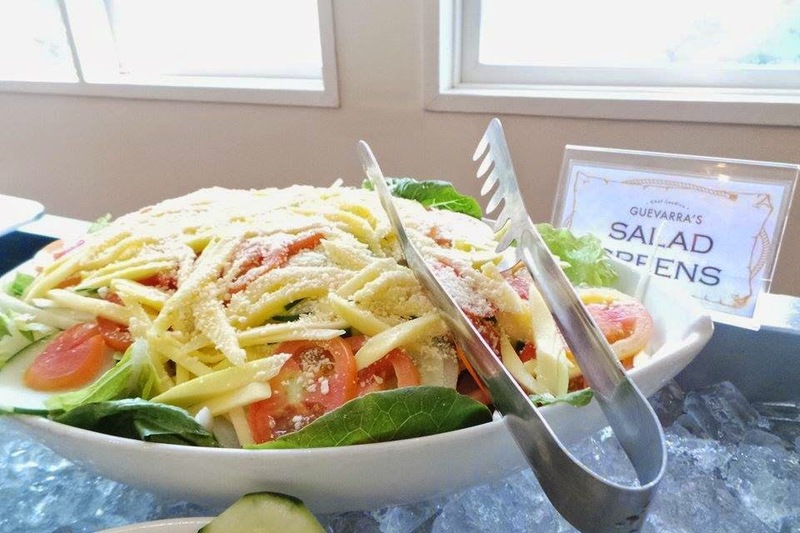 This assures customers that food stays fresh, no matter where it is stored or how often the door is opened. The Samsung Food Showcase Refrigerator is a premium home appliance, enhancing the modern lifestyles of customers with its beautiful design and creative storage solutions, which make lives more organized and ultimately easier. it is also equipped with Digital inverter Technology that provides energy savings efficiency and guarantees durability as it comes with a 10 year warranty”‘. 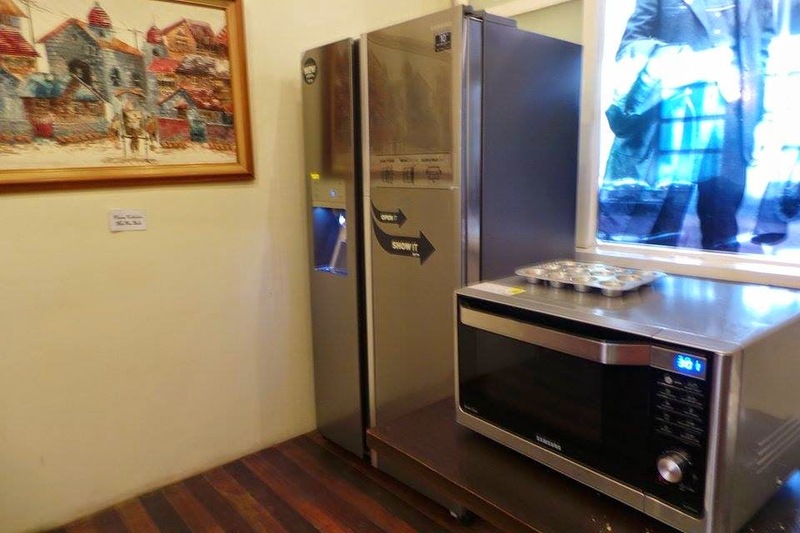 The Samsung Food Showcase Refrigerator (with Ice and Water Dispenser) is priced at Php 139,900 and Php 129,900 for the basic model. Available at all authorized Samsung dealers nationwide. 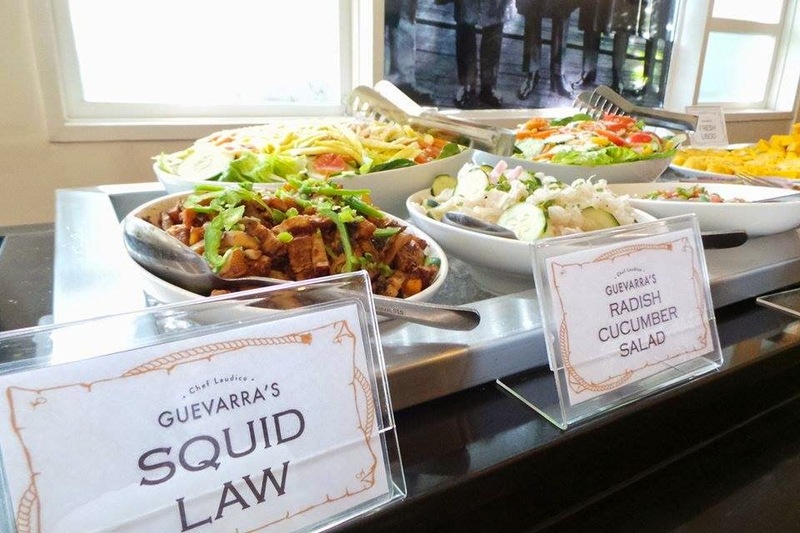 Everyone had a grand time exploring every nook of Chef Laudico Guevarra's renovated house turned into restaurant. 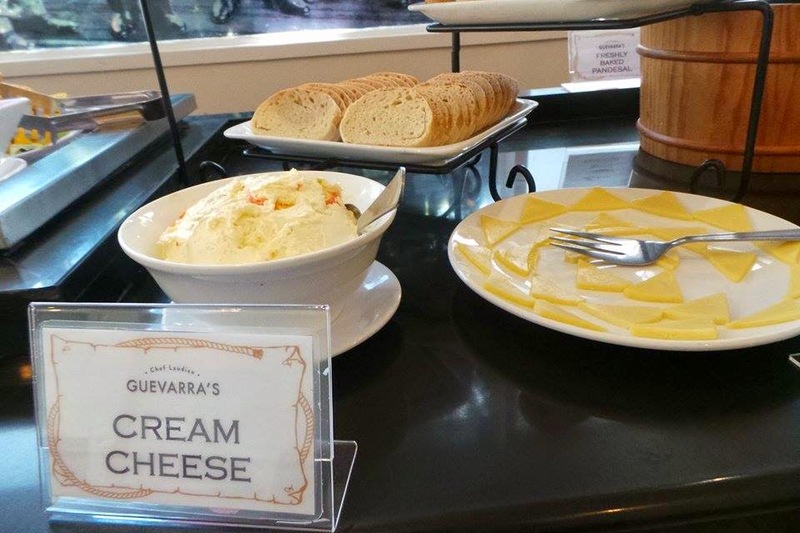 It is indeed a haven of good food, with its classic interior. 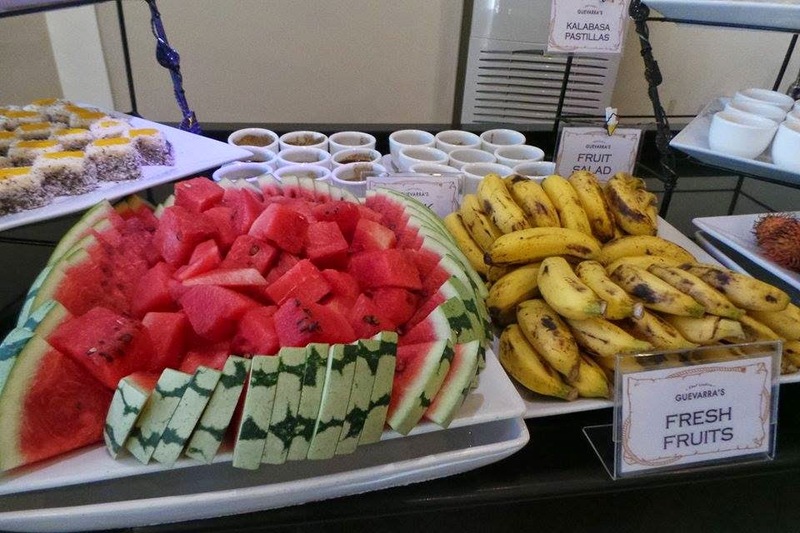 Samsung Digital Appliances treated the media and their kids to a sumptous buffet breakfast. 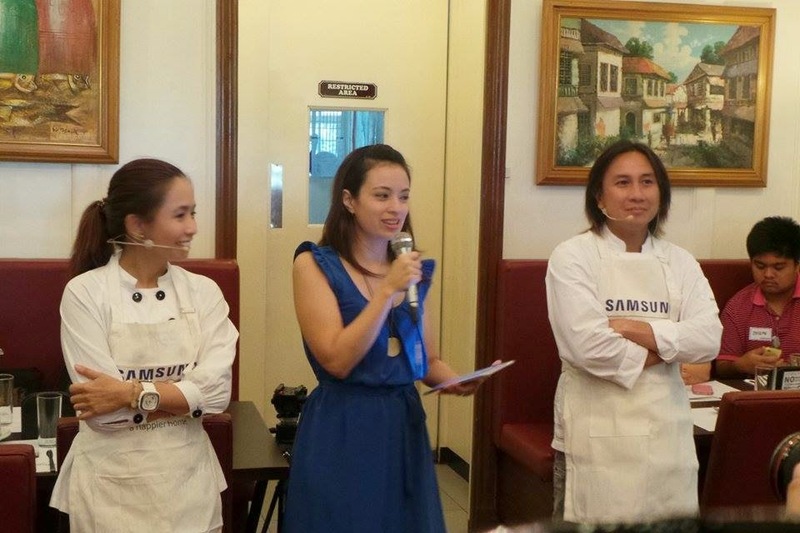 It was a Samsung Saturday made to remember with moms and children. 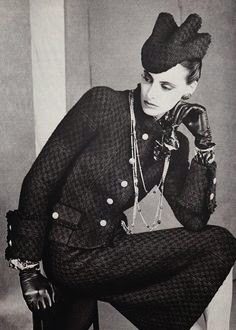 To those who did not know, tall, beautiful and skinny Ines de la Fressange started out as a model and muse in the 80s for Karl Lagerfeld and Chanel and also was named International Best Dressed List Hall of Fame in 1998. She is an aristocrat and a daughter of the Marquis de La Fressange , a total embodiment of french chic, with a style all her own, timeless and elegant. Inspired by the success of the first collaboration for Spring Summer 2014. 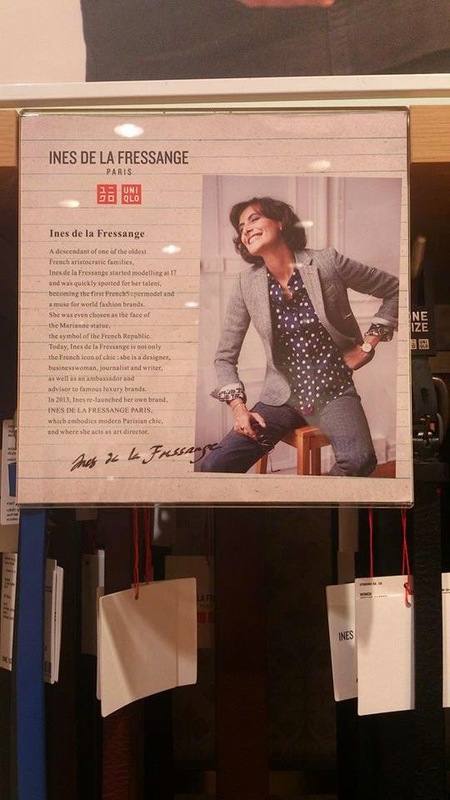 Uniqlo unveils its second collaboration with French fashion icon Ines de la Fressange as part of its Fall Winter 2014 collection. 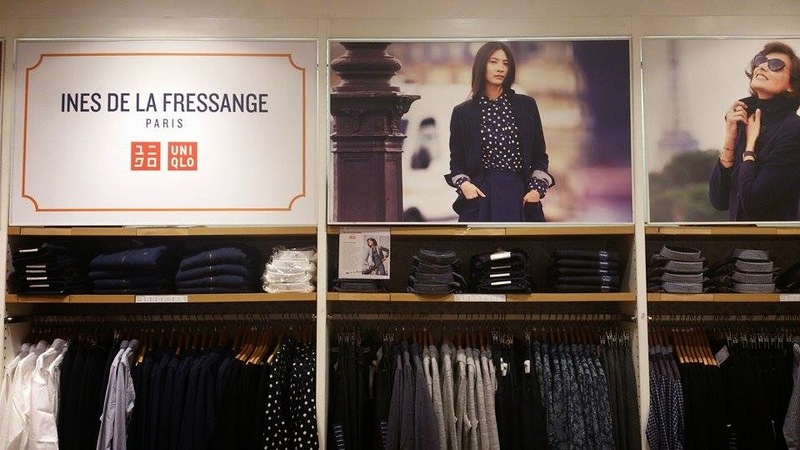 The Ines dela Fressange Fall winter 2014 collection was presented to the bloggers on September 26, 2014 at the UNIQLO store SM Mega Fashion Hall. An OOTD contest for the fashion bloggers was held and the winner took home a trench coat, just by uploading a selfie at Instagram or Twitter styling their favorite Ines dela Fressange collection. What I like about IDLF collaboration is that, there is a hinge of the 80s in it. The floral tweed coat was a fixture in the 80s scene with its playful details. This collection is an iteration of UNIQLO’s LifeWear. 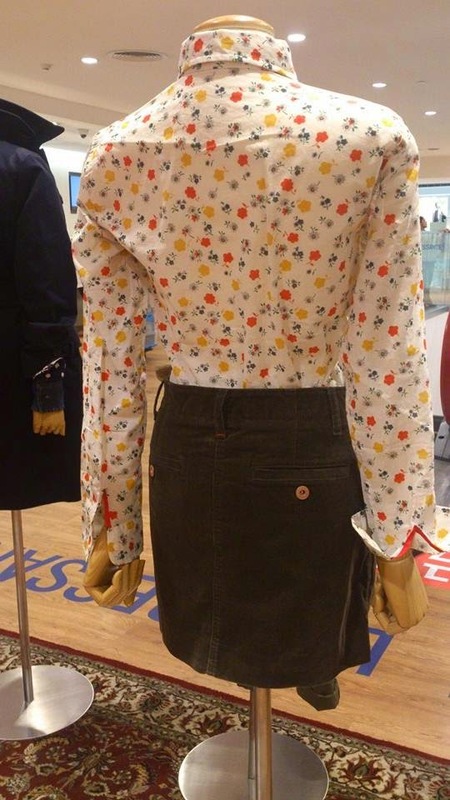 Commenting on the second collaboration line, Ines de la Fressange said, “I wanted to retain the spirit we created in the Spring Summer collection. I love things that are unadorned, genuine, and comfortable to wear. 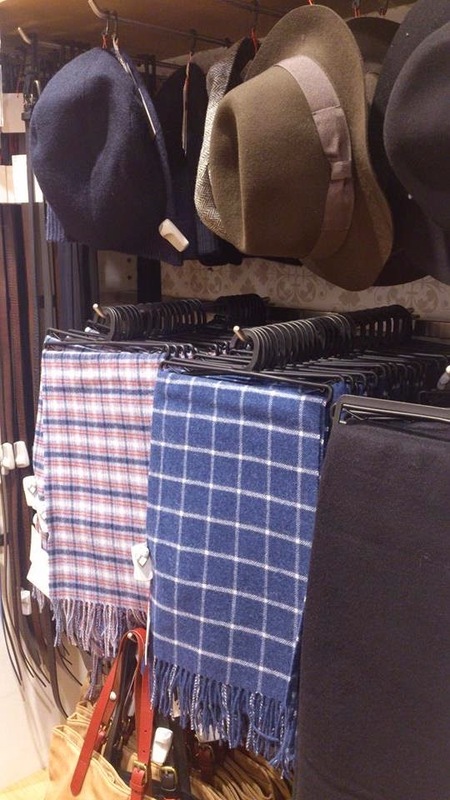 For the Fall Winter items, I wanted to create lovely things that have the same elegance. One of the traditional European fabrics I wanted to include was tweed. With coats and jackets, the fabric and cut are important, and it was a real treat for me to be able to incorporate playful details and enjoy styling the clothing freely. I try to take the position of women today, and come up with ideas that take account of such factors as closet space and budgets. No one can live surrounded by unlimited clothing. Having many items is not necessarily a good thing, and it’s important to have ‘good clothes’, The point I wanted to express with the new collection is that even without a detailed fashion knowledge, women can find something beautiful to wear. They can have a full wardrobe. The Fall Winter collection is even better than I expected, and I’m extremely pleased with the elegant line. Design Director Naoki Takizawa said, “Like the streets of Paris, where novelty and beauty can be found in the constant blending of diverse elements throughout the city’s long history, this is a collection of essential apparel that quietly radiates through the styling. It is clothing that is simple, but with playfulness that prompts a smile. It is clothing that brings you back to your natural self just by wearing it. 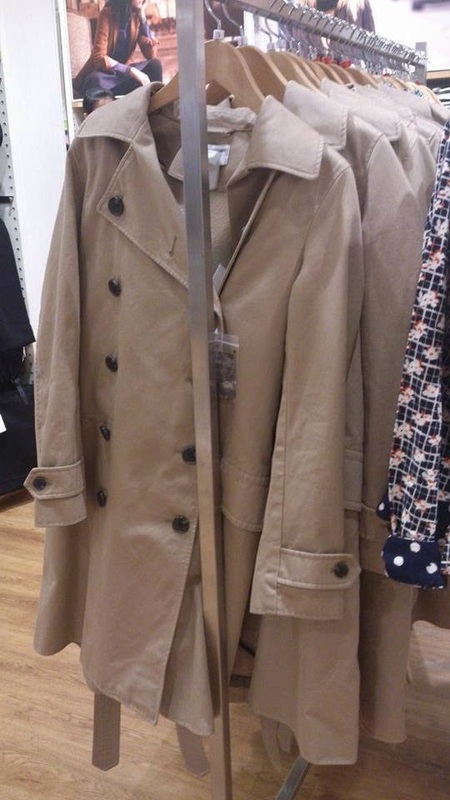 Talking with Ines, I begin to see clothing that anticipates the next era. 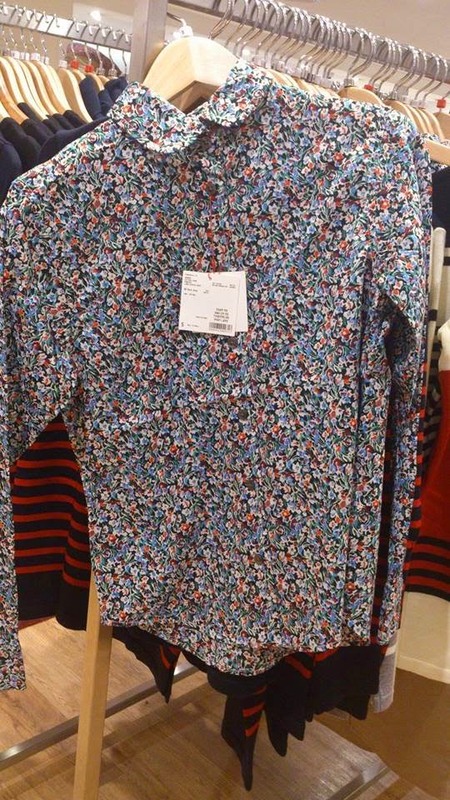 It then starts to overlap with UNIQLO’s LifeWear concept. 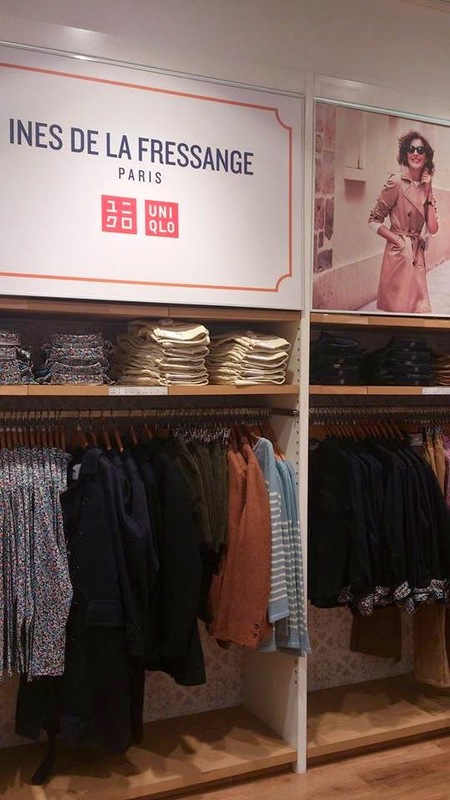 The collaboration line is an iteration of UNIQLO’s LifeWear, aimed at enriching lives through quality clothing. Rather than following trends, it focuses on what Ines herself wears, to look and feel great. Each detail, from the height of the waist and opening of the neckline to overall fit, has been carefully refined through a long fitting process with Ines herself, to create a perfectly balance collection. Featuring smartly cut shirts, classic trench and tweed coats, casual cashmeres, chic trousers and Ines’ favorites, like the elegant tuxedo jacket and simple silk dresses, each piece translates easily from day to night. And each is a great addition to any woman’s, but most especially a working woman’s wardrobe. The collection’s understated elegance is predicted to resonate across women of all ages and cultures. 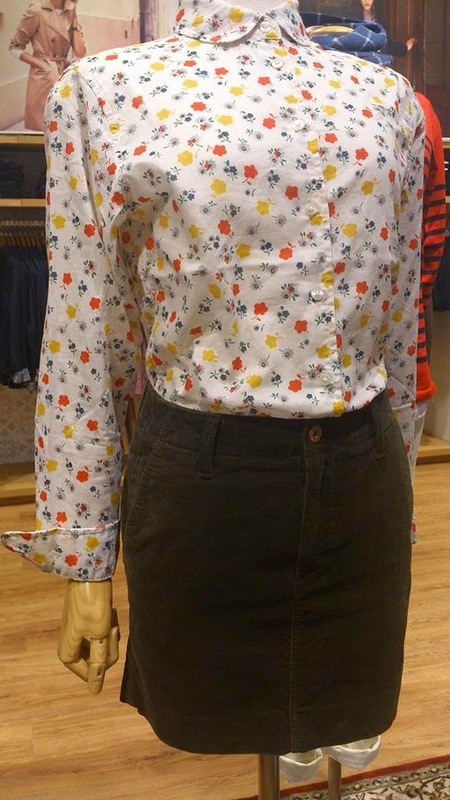 A true testament to UNIQLO’s global fashionability. The IDLF collection will be available at UNIQLO SM Megamall, SM Aura and Glorietta 5. 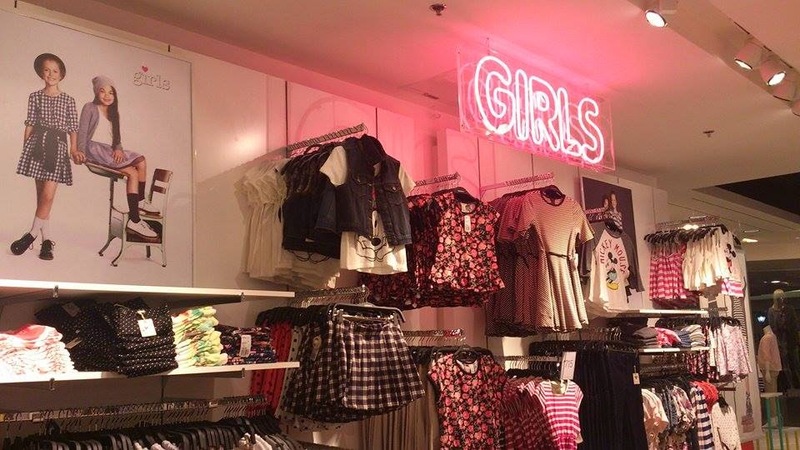 The first flagship store Forever 21 at SM Megamall got the new look. 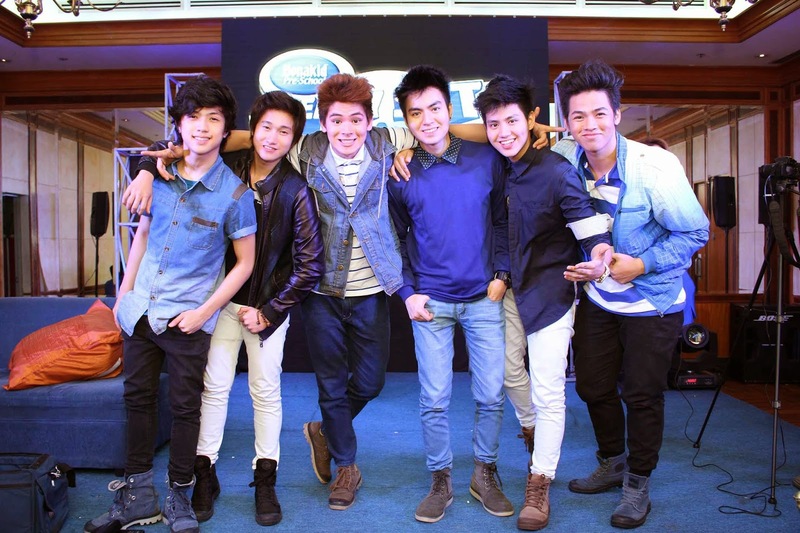 It was 4 years ago, when I trooped down Forever 21's first flagship store at SM Megamall. I lined up for 5 hours just to get a peek inside and bought my first F21 tops and jeans. It was an amazing and exhilarating experience, with all the mix crowd, everyone was excited then. 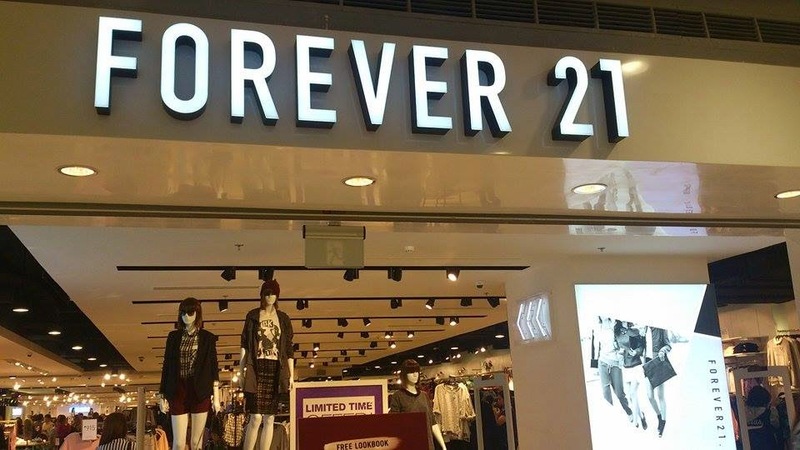 Now comes the newly revamped Forever 21, the store was launched last September 25, 2014, the new interior has the youthful vibe feel and elegant aesthetic to the shoppers. The clean and sleek slated interiors explain why it still remain the number one fashion store in the country. 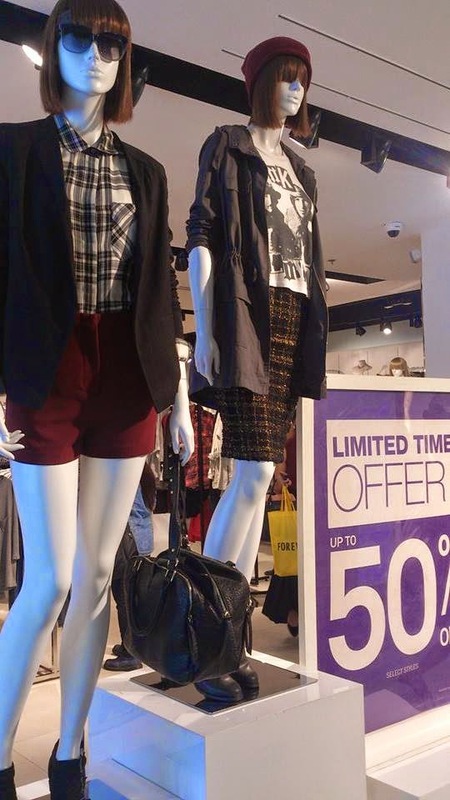 Forever 21 SM Megamall launched The Outer Wear Edit Fall Collection on Sept 25. 2014. It offers affordable tops from boho-chic to normcore, fashion accessories, shoes, sandals, and bags to the delight of the shoppers. Customers can also look forward to a more varied selection of items covering a multitude of trends to understated elegance. With fresh takes on partnerships with Keith Haring, Jean-Michel Basquiat, NBA, and Mattel, Forever 21, is now the fashion portal for all boho's, or any laid back tops, skirts that you have in mind. The topmodel has graced the covers of several major American and international fashion magazines as well as gained status as a model-off-duty street style icon. 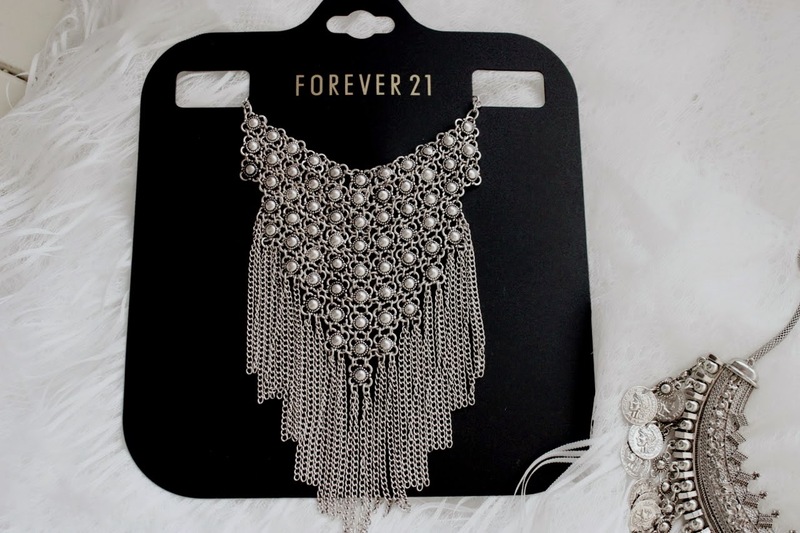 Forever 21 shoppers can literally wear their hearts, hobbies, and interests on their sleeve. AXN, Asia’s home of thrilling entertainment, premiered the latest seasons of hit series “The Voice” and “The Blacklist” to top ratings, winning the night of September 23 among English general entertainment (GE) channels across Southeast Asia. Collectively in the markets of Singapore, Malaysia and the Philippines, the seventh season of “The Voice” and the second season of “The Blacklist” both rated as the No.1 show across all English GE channels in their time slots among pay-TV audiences. In Malaysia, “The Voice” season 7 won the timeslot among approximately 70 rated English language channels among pay-TV audiences 4 – 54. In addition, “The Blacklist” season 2 was the top rated show for individuals from high income households. 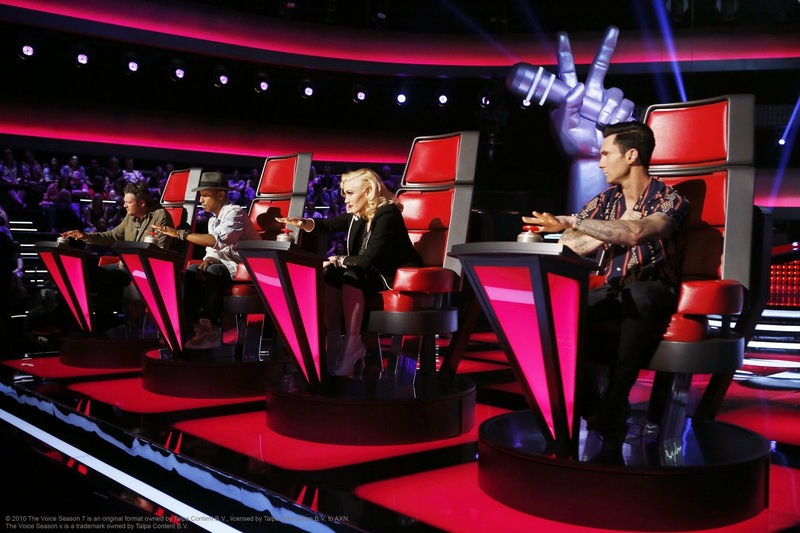 In Singapore, “The Voice” season 7 was the highest rated program among rated English language cable channels for all pay-TV audiences in its timeslot. “The Blacklist” Season 2 proved to be spot on with AXN’s target audience of professionals, managers, executives and businessmen (PMEB), as it was their top rated show of the day across all 73 rated channels on StarHub TV. 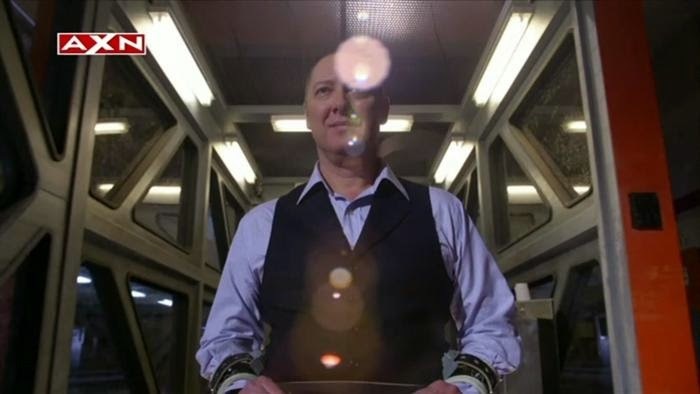 In the Philippines, “The Voice” also led the English GE genre for all pay-TV viewers in its timeslot; while “The Blacklist” was the top show in its timeslot among pay-TV audiences ages 35 – 44. 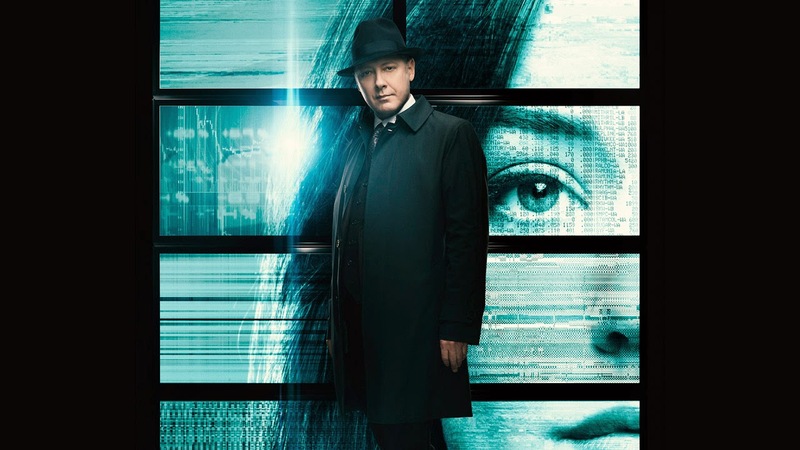 “With two of TV’s most-anticipated returning shows airing on AXN, it was important for us to bring The Voice’ and ‘The Blacklist’ to our audience in line with the US, as well as give it a strong marketing push. We are pleased to see that this strategy has paid off and will continue to build on this success,” said Hui Keng Ang, senior vice president and general manager, Networks, Asia, Sony Pictures Television. 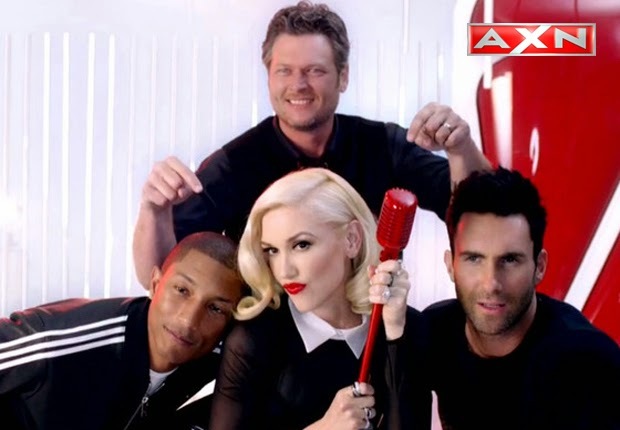 Airing on Tuesdays at 8.05pm first and exclusively on AXN, “The Voice”, which won its second consecutive Emmy for “Outstanding Reality-Competition Program”, features Gwen Stefani and Pharrell Williams as celebrity musician coaches for the first time. They join Adam Levine and Blake Shelton in search of America’s next Voice. In promotion of the series, AXN is sending the iconic red chair of “The Voice” coaches on tour to some of Singapore and Malaysia’s busiest locations, where fans can get photo opportunities and engage with the accompanying games and performances. A “The Voice” branded train is also bringing the show closer to commuters in Singapore. Airing on Tuesdays at 10pm, “The Blacklist” returns to follow the exploits of James Spader’s (“Boston Legal”) criminal mastermind Raymond ‘Red’ Reddington who turned himself in and is working with the FBI to eradicate his ‘blacklist’ of politicians, mobsters, spies and international terrorists, under the condition that he works only with rookie FBI agent Elizabeth ‘Liz’ Keen (Megan Boone, “Law & Order: Los Angeles”). Lookalikes of ‘Red’ Reddington are taking to the streets of Singapore and Malaysia to engage with AXN viewers and for photo opportunities to drive buzz and sharing on social media platforms. Happy banter between the hosts during the press con as Drew shared new things to look forward to for the second season. As Bonakid Pre-School and GMA Network make the show’s components bigger, they of course, would not forget making the key element of the show - the Game Arena - twice as big from last year! The challenges and activities in the game arena are inspired by Pinoy games that moms today nostalgically grew up with. 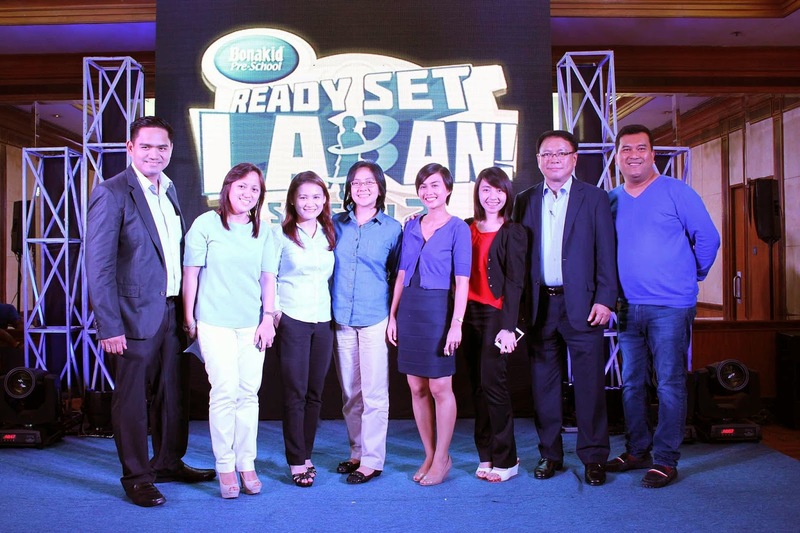 “We want to encourage kids to experience these Pinoy games just like their moms did. With these games, we want to demonstrate the strength, energy and resilience of these kids and bring out the “Batang May Laban” in them. 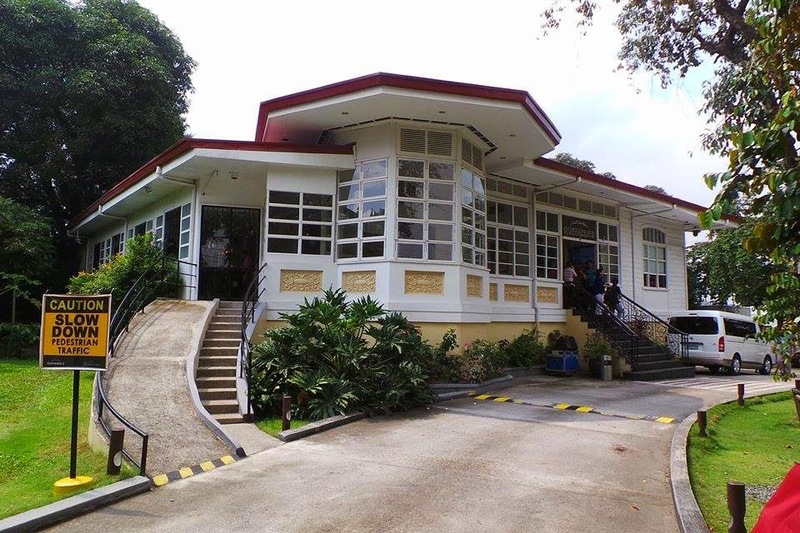 This is part of Bonakid Pre-School’s commitment to help moms empower their kids so that they will have the strength and confidence to conquer any challenge,” says Claudine Serrano Product Manager of Bonakid Pre-School. The Bonakid Pre-School team with partners from GMA. Your kids will surely love the Marvel Super Heroes Join the Best-Selling Disney Infinity Video Game Franchise, the super heroes that they used to watch in the movie, is now available and ready to play with using their consoles. There is also an easy-to-follow walk through for all ages. Learn how to build and customize your own virtual world with a huge variety of Disney characters, powers, and gadgets. Explore the disney world in style together with your kids and the kids at the heart. 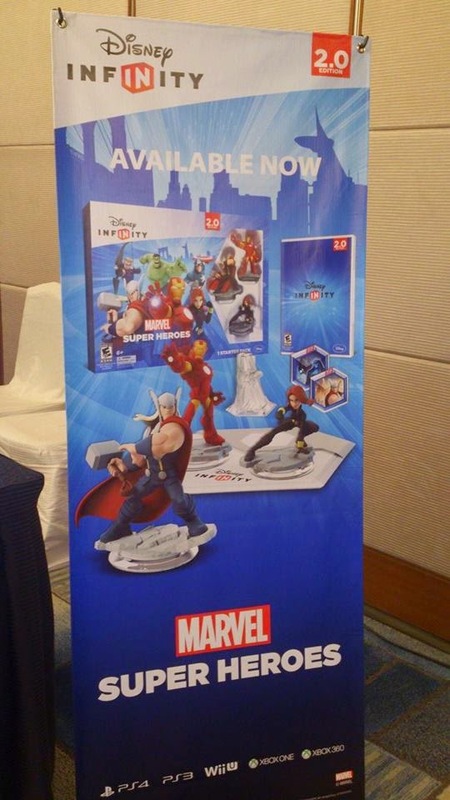 Disney Interactive and Marvel today launched Disney Infinity: Marvel Super Heroes on Sept 24, 2014 at Makati Shangri-la– the follow up to last year’ages #1 best-selling new hybrid toy/video game of 2013 (according to the NPD Group’s video games retail sales data). The game is available for the PlayStation 4 and PlayStation 3 computer entertainment systems, Xbox One, the all-in-one games and entertainment system and Xbox 360 games and entertainment system from Microsoft, and the WiiU system from Nintendo. The Disney Infinity: Marvel Super Heroes Starter Pack features the 2.0 game software, the Disney Infinity 2.0 Base, Marvel’s The Avengers Play Set with three character figures (Iron Man, Black Widow and Thor),two Toy Box Game Discs, a web code card and countless hours of creative play in the all-new Toy Box 2.0. Marvel’s Spider-Man and Guardians of the Galaxy Play Sets, along with additional figures from those worlds, will be sold separately. 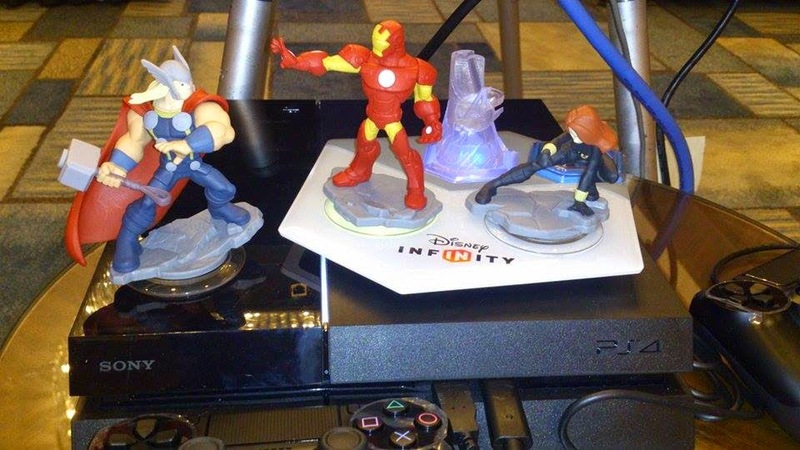 All characters and Power Discs from last year’s release of Disney Infinity are compatible with Toy Box 2.0. The new game introduces interactive Super Hero figures from across the Marvel universe with original Play Set storylines written with the help of award-winning Marvel comic writer Brian Michael Bendis. Each new character brings a variety of super-powered and unique gameplay mechanics such as flying, web slinging, wall crawling, wall smashing and more. An improved Toy Box 2.0 mode makes it easier for players to create and share their one-of-a-kind levels and games with family and friends using their favorite Marvel and Disney characters, vehicles, settings and items. New and enhanced Toy Box tools and toys will make the groundbreaking game mode even more accessible for players of all ages. Toy Box Game Discs deliver new structured gameplay modes to the Toy Box where players can engage in classic Dungeon Crawler and Tower Defense gameplay using any character from across the Disney Infinity universe. Community continues to play an important role in Disney Infinity: Marvel Super Heroes, with the availability of new Toy Boxes created by the recently hired Avalanche Software Community Team. These super-fans turned level designers will be designing immersive, themed Toy Boxes and episodic content for Disney Infinity players to download for free at launch and beyond. 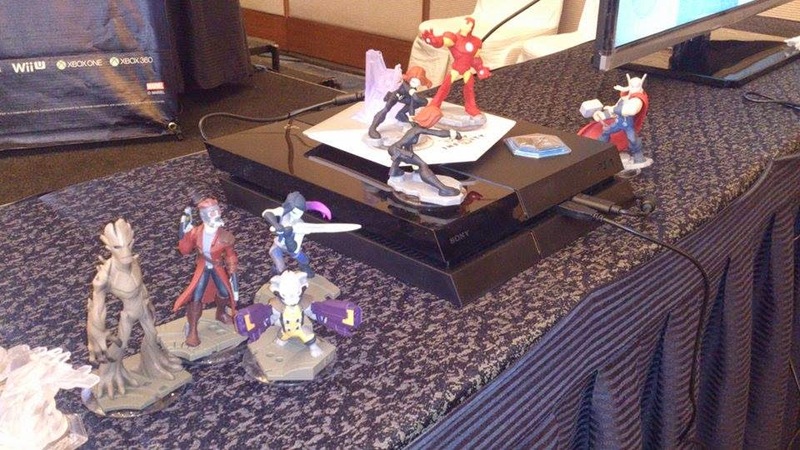 Also available at launch will be select Toy Boxes designed by Toy Box Artists from around the world at the inaugural Disney Infinity Toy Box Summit this past August. 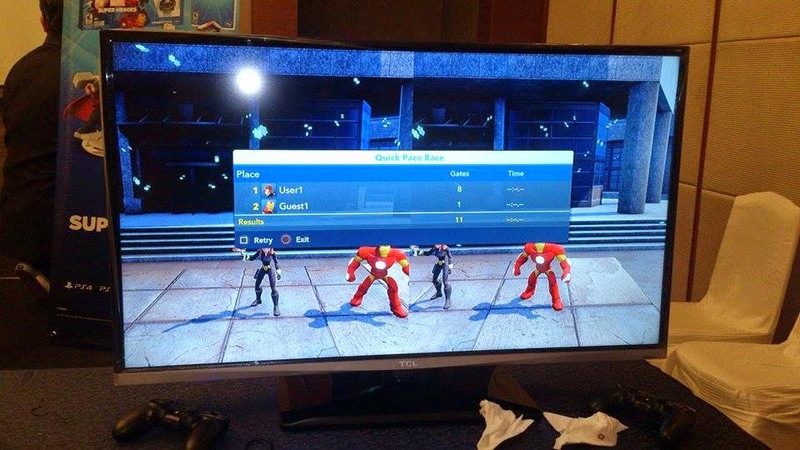 Developed by Avalanche Software, the Disney Infinity: Marvel Super Heroes Starter Pack carries a suggested retail price of PHP 3,799.00 and all versions are rated "E-10+" by the ESRB. The Spider-Man and Guardians of the Galaxy Play Sets are available separately for a suggested retail price of PHP 1,849.00.Individual character figures are available for a suggested retail price of PHP 679.00 and blind Power Disc packs for PHP 289.00. For additional information, please visit www.disney.com/infinity and www.youtube.com/disneyinfinity, join the Disney Infinity Facebook community (Facebook.com/disneyinfinity) and Google+ community (https://plus.google.com/+DisneyInfinity), and follow us on Twitter (twitter.com/disneyinfinity) and Instagram (instagram.com/disneyinfinity). Disney Interactive, one of the world’s largest creators of high-quality interactive entertainment across all platforms, is the part of The Walt Disney Company responsible for the global creation and delivery of interactive entertainment, multi-platform video games, and family-focused content across all current and emerging digital media platforms. Disney Interactive produces and distributes a broad portfolio of content from Disney Interactive Games and Disney Interactive Media. Products and content released and operated by Disney Interactive include blockbuster mobile, social and console games, online virtual worlds, #1 kid’s entertainment destination Disney.com and the #1 Family/Parenting portfolio on the Web. Disney Interactive is the interactive entertainment part of The Walt Disney Company (NYSE: DIS).